CRNA Theresa Sheehan, center, received the Eleanor Bradley Award. The Department of Anesthesiology celebrated the work of its dedicated nurse anesthetists during National CRNA Week, January 20-26. Department Chair Dr. Hugh C. Hemmings, Jr. kicked off an evening full of laughter and accolades in the Griffis Faculty Club. "Thank you for your dedication to our patients and for being such loyal and outstanding team members as we work for and with NewYork-Presbyterian to deliver the most outstanding care in New York," said Dr. Hemmings. "Our team of CRNAs is well-known to be one of the best anywhere, and I am incredibly proud of that." Two CRNAs were recognized for their outstanding contributions in 2018. Theresa Sheehan received the Eleanor Bradley award, given annually to a CRNA who exhibits leadership, professionalism, compassion, diplomacy, loyalty and dedication. 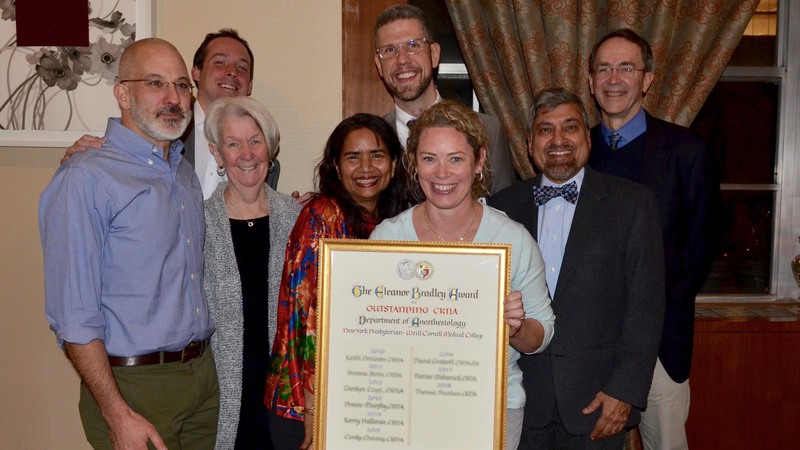 Eleanor Bradley, a chief nurse anesthetist who devoted more than 40 years to NewYork-Presbyterian/Weill Cornell Medical Center, attended the dinner and presentation of the award bearing her name. Sean Harper received the Outstanding CRNA of the Year award for Lower Manhattan Hospital (LMH), during a dinner at The Paris Cafe. Sean Harper, winner of the CRNA of the Year Award at Lower Manhattan Hospital. "CRNA week is the perfect time to bring everyone together for a special dinner and acknowledge one CRNA that serves as a role model for clinical excellence, compassionate care and collaborative teamwork," said David Leal, chief CRNA for LMH. "I am so proud of Theresa Sheehan and Sean Harper for being selected CRNA of the Year." CRNA dinner for Lower Manhattan Hospital was held at The Paris Cafe.